If you have a sweet tooth, you may be used to eating dessert most days. Sometimes fruit or a fruit salad will do for a light dessert. Other days, you just need a brownie. Baked goods like brownies are often high in sodium, even though they don’t taste salty. Between leaveners like baking soda and baking powder, salted butter, and added salt, brownies and other baked goods can be sneaky sources of sodium! If you bake your own brownies at home, you can control the amount of sodium-containing ingredients for a better alternative. 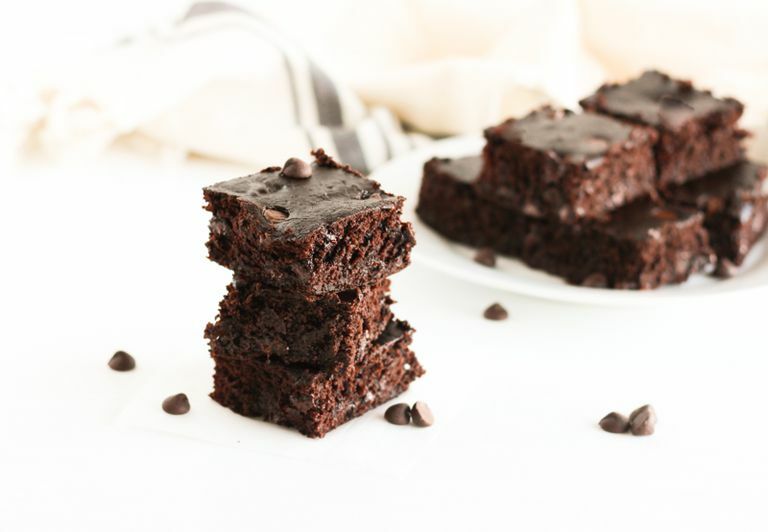 The secret to these flourless brownies is a can of low sodium black beans.Before you write them off, give them a try! Blending up black beans in a high-powered blender or food processor makes them nice and smooth, and when baked into brownies, gives them a nice chewy texture without any flour. They also add in extra fiber, iron, and folate. Heat oven to 350F. Line an 8x8" baking dish with parchment or spray with oil. Blend all ingredients except for unmelted chocolate in a high powered blender until smooth, 1 to 2 minutes. Stir in chocolate and pour into prepared pan. Bake 20 to 25 minutes. Use all chocolate chips if you don’t have a dark chocolate bar. Cocoa powder, melted dark chocolate, and chocolate chips gives these brownies lots of rich chocolate flavor with a little boost from coffee granules. If you don’t have the coffee granules don’t worry—you can leave them out and you’ll still have delicious chocolatey brownies! Avoid over-cooking—the designated time should be just about enough, but you can check before removing from the oven. Brownies shouldn't be overly dry. Store leftovers in the refrigerator and heat for 20 to 30 seconds in the microwave before serving.